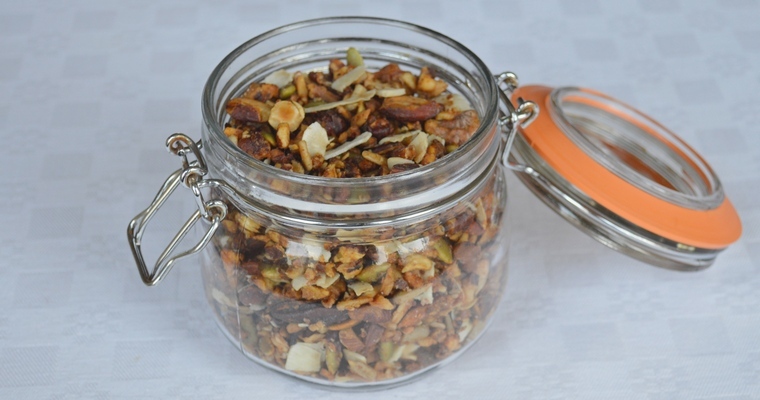 Delicious crisp and toasty breakfast granola, free from oats. This Gluten-free, Dairy-free and Paleo recipe is made with nuts, seeds, coconut oil and honey. This quick and easy recipe can be made in bulk ahead of time, and makes a great addition to breakfasts. A couple of tablespoons makes a lovely crunchy topping for porridge, or it can be eaten like a traditional cereal with almond milk, or coconut yoghurt, or a fruit compote. You can adapt the mix as you like, adding or omitting nuts according to what you have in your cupboard. I find the ratio of 1 part seeds to 3 parts nuts gives the best flavour and texture. You could make a chocolatey version by adding cacao nibs or chocolate chips once the mixture has cooled from the oven, or add some dried fruit like raisins, goji berries and chopped apricots. If using, scatter the coconut chips in a single layer on a large, metal roasting tray. Transfer to the preheated oven and roast for 2-3 minutes, until just starting to colour. Watch carefully, as they can quickly burn! Once lightly golden, remove from the oven and spread over a plate to cool. Bash the hazelnuts until they break apart into small pieces – you can use a pestle and mortar to do this, or seal in a bag and bash with a rolling pin. Tip into the roasting tray. Repeat with the almonds, then the walnuts, then the pecans. Add the seeds to the roasting tray. Combine the coconut oil, honey and salt in a small bowl, and stir until fully blended. Scrape over the nut and seed mix, then toss until evenly coated. Arrange in a single layer, giving the pieces room to roast and brown. Use two trays if necessary. Transfer to the oven. Roast for 10-15 minutes, until toasted and lightly browned. Stir halfway through, and turn the tray for even colouring. Leave to cool, spread out on the tray. Once cooled, mix in the coconut chips and transfer to an airtight container. Store at room temperature for up to 4 weeks. Serve as a porridge topping, or like a traditional cereal with almond milk.